The Australian Boat Race is the annual rowing match race between the Sydney and Melbourne University Boat Club. Held annually, the venue alternates between the Yarra River in the heart of Melbourne and on the Sydney Harbour. It encapsulates the long-standing rivalry between two great cities and two great universities. It is set to become a showcase event on each of the cities’ iconic watercourses and is the new chapter of a 150-year-old rivalry between these two Universities both on and off the water. Sydney and Melbourne University are Australia’s oldest and best-known universities. Their rowing clubs were founded in 1859 and 1860 respectively and are currently the two most successful rowing clubs in Australia, together contributing 18 athletes to the London Olympic rowing team. The two rowing clubs met informally on the Yarra in 1860. By 1870 the rowing competition between Sydney, Melbourne and Adelaide universities became a regular feature, eventually growing into the annual intervarsity competition still held today. Australia’s future first Prime Minister Edmund Barton rowed in the Sydney boat at the first regatta in 1870. While the University of Melbourne was victorious on that first occasion, there has been a 150-year-old rivalry between these two universities both on and off the water. Almost 150 years after the first regatta, the first Australian Boat Race was contested as a time trial as part of the 2009 Head of the Yarra, with Melbourne claiming victory in both men’s and women’s. Following this, the Vice Chancellors, Dr Glyn Davis (Melbourne) and Dr Michael Spence (Sydney) agreed to an annual “match race” between men’s eights and women’s eights from each university. The second Australian Boat Race took place in 2010 over a 6.9 km course in Sydney from Leichhardt Rowing Club to Riverview Wharf. In 2011, it returned to Melbourne and was held over 4.2 kms on the Yarra River in central Melbourne, starting at the Docklands-Casino Precinct and finishing at the Melbourne University Boatshed near Flinders Street Station. The two universities have between them 100,000 students, 8,000 staff and approximately 485,000 alumni in Australia and around the world. Sydney and Melbourne University alumni include Nobel laureates, Oscar winners, business leaders, medical pioneers, artists, intellectuals and activists. They have all benefited from the University’s determination to develop curious minds that are ready to embrace challenges and devour knowledge, to reveal new perspectives and find solutions. Sydney and Melbourne University rowing clubs contain some of the nation’s finest athletes. The crews, which include several Olympians, are high achievers balancing academic, sport and business commitments. The sport of rowing is widely recognised as clean, physically demanding, and requiring disciple and teamwork. Not only will they have the weight of expectation from their teammates, but also the pride of their Universities and States are at stake. The history and rivalry between two of Australia’s oldest and greatest universities and their rowing clubs creates a new race with an immediate sense of tradition – one that is quickly becoming a major annual event. It is set to become a showcase event on each of the cities’ iconic watercourses. The race returns to Sydney Harbour in 2018. This trophy designed and produced by Melbourne sculptor Jennifer Mann is named after Australia’s first Prime Minister. More importantly though Edmund Barton represented Sydney University in the two seat of the first official Intervarsity race between Sydney, Melbourne and Adelaide universities. The race was in fours and held on the Yarra. Edmund Barton was born in Glebe in 1849 just a stone’s throw from Sydney University. He attended university from 1865 to 1870 earning a Bachelor and Masters in Arts. He was admitted to the Bar in 1871. Barton was active in sport (cricket and rowing) and in politics. One notable point was his umpiring of cricket and in one particular colonial match (NSW v Lord Harris’s English XI) in which a riot broke out after a decision in favour of the English Xi by his fellow umpire. Barton served in the NSW parliament from 1879 and was strong supporter of efforts to form the Australian Federation. He was a noted “free trader” and saw the freedom of commerce between the states as a major benefit of federation. After three years of tireless campaigning for Federation Barton was the first of 49 delegates elected to the Australian Federal Convention. He became chair and leader of the chairman of the drafting and constitutional committees of the Convention. Barton played a pivotal role in drafting of the Australian Constitution and was elected to the first Federal Parliament in December 1899. After William Lyne failed to secure the support required to form government Barton was requested to form a government and announced his Federal Cabinet on Christmas day 1899. The Federation of Australia was duly proclaimed on 1st January 1900 with Edmund Barton as Prime Minister. 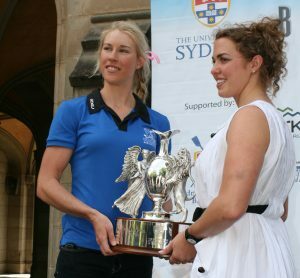 This trophy designed and produced by Melbourne sculptor Jennifer Mann is named after the first woman graduate of Melbourne University – Bella Guerin. Bella Guerin was born at Williamstown in Victoria in 1858. She was admitted to Melbourne University in 1878 gained her Bachelor of Arts in 1883 and Master of Arts in 1885. Following her graduation Guerin became a teacher in Melbourne, married and had one child. After her husband (many years her senior died) she returned to teaching and moved to Sydney. She was active in women’s causes and fought for the inclusion of women in political life. Appointed vice-president of the Australian Labor Party’s Women’s Central Organizing Committee in March 1918, she aroused censure and controversy for describing Labor women as “performing poodles and packhorses”; under-represented in policy decisions and relegated to auxiliary fund raising roles. Henceforth she organized for Labor “only so far as it stands for those principles represented by the Red Flag”, believing in the parliamentary system but desiring capitalism’s elimination. She described her political evolution as from “Imperialistic butterfly” to “democratic grub” and experienced continual tensions as a socialist feminist within the Labor Party.